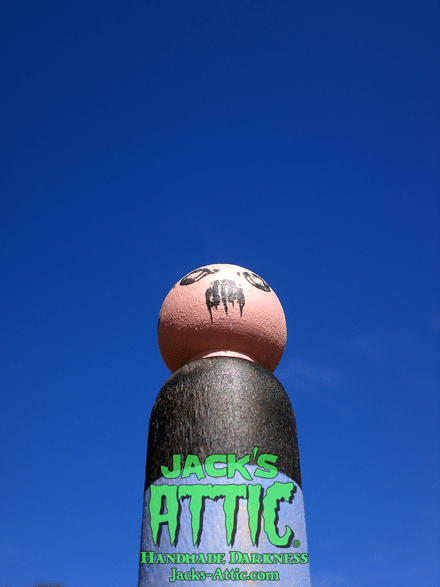 When designing this limited edition, primitive, wooden poppet, we here at Jack’s Attic wanted to create a piece that culled together several areas of varied inspiration. Firstly, we wanted to fashion a collectible artwork that had the look and feel of an antiquated, olde world style, wooden peg figure. Simple wooden figures such as this had been carved for children prior to the industrial age of machined plastic and commercially available toys. A second and more contemporary influence was the classic Fisher-Price Little People toys a lot of us grew up playing with as children. The Little People figures encapsulated a simple timelessness with bright colors and a certain wholesome sweetness. 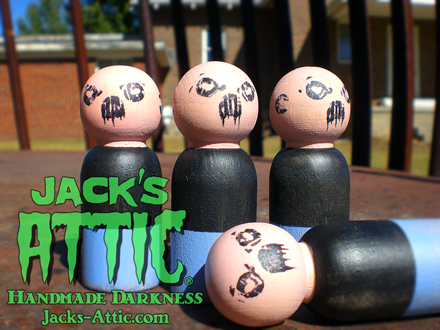 With Jack’s poppets we wanted to emulate this simplicity and maybe even a twinge of the sweetness but also counter balance the figure with that same dark thread that unites all of our work. The final inspiration for our figures was the urban vinyl toy trend initially started by underground graffiti and graphic artists which has since entered into the collective mainstream. These toys were miniature canvases on which the artists showcased a “do it yourself” style of art and promotion that was only available in small numbers and in certain regions. Doug measures approximately two (2) and 5/16 inches tall and is limited to a series of only ten (10) pieces. Each poppet is hand painted and distressed to create a worn and antiquated affect wholly unique to each figure. Packaged with a hand numbered and signed custom header card each piece also bears corresponding hand numbering as well. Doug is available for purchase in both our Art Fire Studio as well as our Etsy Shoppe for $10.